1. Introduce magic early on. In the first chapter, there should be a hint of the supernatural. It’s not cool to get halfway through a book and discover that your main character is really a mummy without several big hints along the way. It works against a reader’s suspended disbelief. In EE, Ella is cursed by a fairy as an infant and it’s introduced in the very first paragraph. Straight away, the reader knows what kind of story this is going to be and can adjust their expectations accordingly. 2. Don’t give your character a superpower and not have them use it. Reading minds, flying, starting fires, talking to animals. If your character has special abilities, the reader wants to see them. They’re special. Even better, is if the ability is both a curse and a blessing. Give the character a little struggle and internal conflict—perhaps they lose something each time they use their magic or perhaps they have to make a trade/self-sacrifice for it. High stakes=good tension. 3. Lay out the rules for magic and then stick to them. In EE, Ella is cursed with obedience. The rule is, she has to follow a direct order. The book maintains that rule throughout the book—every time Ella is given a direct order, no matter how ridiculous or dangerous, she must follow it. If the rule were to change halfway through the story (without explanation), the reader would balk. Like in playing a game, you can’t change the rules in the middle. 4. Give your magic a purpose. Use it to propel the plot forward, add tension, and conflict. Make it cool and different. Make it necessary to the story. 5. Rinse and repeat for magical creatures. Make them believable, give them a set of rules and make them integral to the story. 6. Don’t overwhelm your story with magic. Don’t get so caught up in your fantasy world that you let it take over your plot. For instance, big action movies that seemed designed around special effects. Your magic should serve the story, not eat it alive. There’s my recipe for Big Magic soup. Got any ingredients you’d like to add? Great tips Laura. It is important to keep the magical system consistent to your world. I have to watch that I don't overwhelm the story with too much magic or magical creatures. Focusing on a few makes the world more believable. Thanks for sharing another tip. And I love your cover. This is great advice. I don't personally overtly reveal the magic in my own WIP at the very beginning, but it is subtly hinted at, so that in going back a reader would realize. Besides, if I ever get it published, I'm sure it would make the jacket copy anyway. Really good article! I haven't used magic in any of my stories, but plan to in a picture book wip. Very helpful post. Good luck with your book, it looks beautiful! 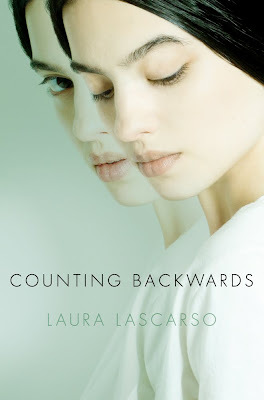 Congrats on the cover for Counting Backwards! I'm intrigued! Love these rules! You make it sound simple. I need to apply these in my own magic book. Awesome tips...I haven't read the book but I thoroughly enjoyed the movie. Yes, magic needs to be introduced early on and sprinkled all over for a wonderful experience for the reader! Awesome tips. Will have to bookmark this one. Thanks so much for sharing. You really got it covered, and so many books jump the tracks when they don't follow these tips. ...discover that your main character is really a mummy without several big hints along the way. What fantastic tips! It's so important to give rules to our fictional worlds, especially when magic is involved. I couldn't agree more! I don't do magic in my writing but I was taken by that cover. Really great! These are fantastic tips. I wholeheartedly agree--especially with #2. That's a pet peeve of mine (when I encounter it in books I read) for sure! I love this advice, Laura. Usually I write contemporary, but I do have a book with a paranormal twist. I'll be sure to check it out against all your guidelines since they make so much sense. Very helpful article. I'm in the middle of an MG book with superpowers. These rules should help me out along the way, especially rule # one. Great tips! I think getting magic right in a story is much harder than it looks! Such great time. And wow, look at that cover! Awesome cover! Great tips, too -- I think a lot of the time magic is handled either with too light a sprinkling or too heavy-handedly. This post definitely helps with that. Also, I love Gail Carson Levine's books, especially EE. I very recently read a YA book that had/has a LOT of buzz about it...and you don't find out that the MC (and her love interest) has 'abilities'/'superpowers' until the very end of the book. The author (and even the jacket copy) leads you to believe it's something else. I found it supremely annoying. (there were some good qualities to the book, but that particular issue was beyond glaring and really killed it for me). Excellent tips. You're right, the best magic books have at least an inkling in chapter one. I loved Ella Enchanted. So cleverly done. Loved the nod to a particular fairytale! Wonderful tips, Laura. I had absorbed these over time, but it's good to have things verbalized. It reminds you and makes you think better as a writer rather than as a more passive reader. And yes, that's an evocative cover! I think these are fantastic suggestions. I love that she uses Ella Enchanted as an example. I love that book!